Sunil Shetty is a popular action hero of Indian cinema who has given a new direction to action films in India. He is a Bollywood movie actor, producer and business person chiefly active in Bollywood. In a career span of over 25 years, he has appeared in over 110 movies. He started off as an action hero and also was a part of some comedy movies. He describes himself as a sportsman at heart, actor by art, humanitarian by virtue, a businessman by default. So, let’s look at the top ten biggest blockbusters of all time! 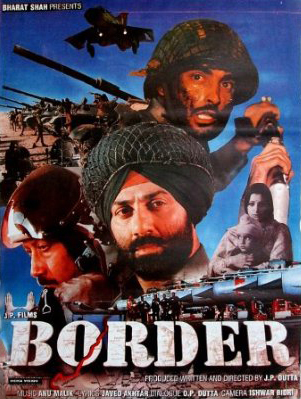 Border is an Indian war drama movie based on the Battle of Longewala during the Indo-Pakistani War of 1971, produced and directed by J. P. Dutta. The film starred an ensemble cast of Sunny Deol, Sunil Shetty, Akshaye Khanna, Jackie Shroff in pivotal roles. 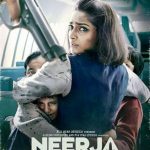 Plot: A troop of 120 soldiers defends their post all night until they receive assistance from the Indian Air Force the next morning. Bhai is an action film directed by Deepak Shivdasani, while written by Kader Khan. The film starred Sunil Shetty, Pooja Batra and Sonali Bendre in lead roles. It is a remake of the Telugu movie Anna starring Rajasekhar, Roja Selvamani, and Gautami Tadimalla. Plot: Kundan, a simple village boy, comes to the city with his younger brother to earn a living. However, fate forces him to take a few wrong steps that end up making him a notorious gangster. 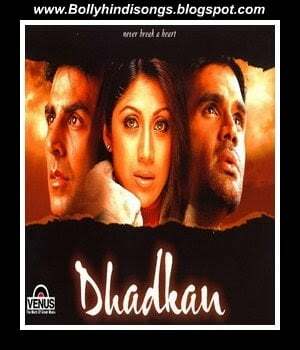 Dhadkan is a romantic drama movie, directed by Dharmesh Darshan. It features Sunil Shetty, Shilpa Shetty and Akshay Kumar in the lead roles, while Mahima Chaudhary makes an extended guest appearance. Plot: Anjali leaves Dev to marry the man chosen by her father. Years later, she runs into Dev again, who is still hoping for a reconciliation with the married Anjali. She, however, sincerely loves her husband. Anth is an action film directed by Sanjay Khanna and produced by Ashok Honda and starred Sunil Shetty and Somy Ali in pivotal roles. Plot: Pooja is attacked by Kali, son of a gangster, and then thrown to her death from a rooftop. Raja, her boyfriend, witnesses this and is also executed. Can Vijay, Pooja’s brother, fight this injustice? 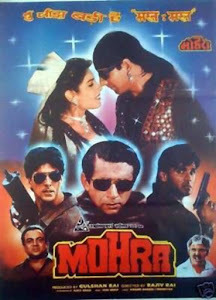 Mohra is an action thriller film directed by Rajiv Rai, starring Akshay Kumar, Sunil Shetty, Raveena Tandon and Naseeruddin Shah in the lead roles with Paresh Rawal, Gulshan Grover, Raza Murad and Sadashiv Amrapurkar in supporting roles. Plot: A man is jailed for four murders but is released with the help of a journalist and her boss. The accused is forced to work for the boss but he soon realises that he is being used. Hera Pheri is a comedy thriller film directed by Priyadarshan starring Akshay Kumar, Paresh Rawal, Sunil Shetty and Tabu. It is a remake of the 1989 Malayalam film Ramji Rao Speaking. Plot: Two tenants and a landlord, in desperate need of money, chance upon a ransom call via a cross connection. They hatch a plan to claim the ransom for themselves. 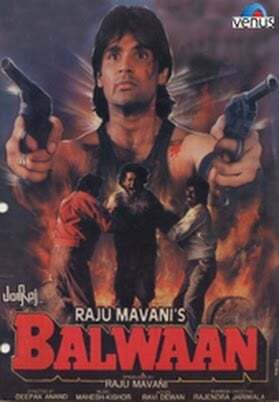 Balwaan is a Bollywood feature film directed by Deepak Anand. 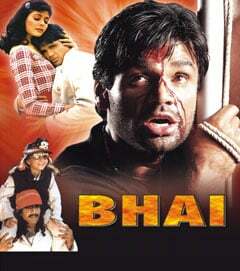 The film has Sunil Shetty in his debut film. Divya Bharti plays the female lead and Danny Denzongpa plays the antagonist. The film was a box-office hit. Plot: Arjun, an honest cop, crosses path with Bhai, a notorious gangster. Bhai frames Arjun for murder and kills his family. Arjun escapes from jail to settle scores with Bhai. 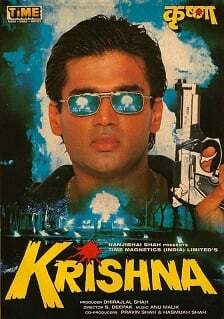 Krishna is an action movie directed by Deepak Shivdasani starring Sunil Shetty, Karishma Kapoor, Om Puri, Shakti Kapoor. Plot: Krishna is out of jail after a seven-year for a crime he did not perform. He is looking to seek vengeance on his wrongdoers and goes on a secret mission with the help from a minister. 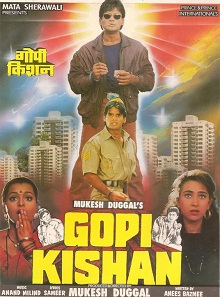 Gopi Kishan is an action comedy film directed by Mukesh Duggal and starring Sunil Shetty in a double role, supported by Shilpa Shirodkar and Karishma Kapoor. 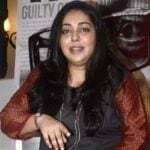 Plot: Barkha respects Gopinath’s guts and his sense of responsibility and falls in love with him. Gopinath has a twin brother who is married and is often mistaken for Gopinath. Sapoot is an action movie directed by Jagdish A. Sharma and starring Akshay Kumar, Sunil Shetty, Karishma Kapoor, Sonali Bendre. Plot: Devastated after the ruthless murder of their father, two brothers set out to abate the existence of the gangster responsible for his death.